The opening ceremony of the “Training Course on Pottery Production Techniques for Sierra Leone, 2018” was held at Matainkay village in Waterloo, 2nd November. “As an innovative way and a new attempt, it is the first time that China implements such training in Sierra Leone for the purpose of benefiting more Sierra Leoneans,” he said. 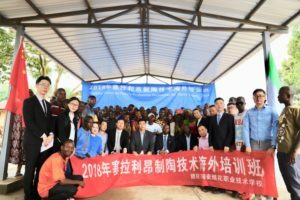 “Both experts and trainees are encouraged to promote bilateral exchange of culture and strengthen people-to-people ties, and this programme is expected to be a platform of learning skills as well as deepening China-Sierra Leone friendship and cooperation,” remarked Zhang.